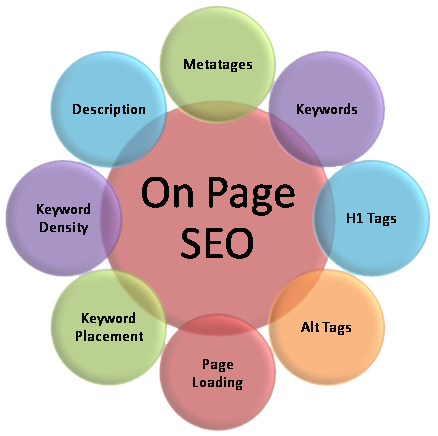 On page SEO has done wonders in the world of digital marketing or SEO. Without optimizing your website, you won’t get great results. While implementing on page SEO, one must make sure that every page of website is indexed by search engines. For this, it is recommended to create an XML sitemap and submit to Google through Google webmaster tool or GWT. One must make sure that there is at least one link for each of the pages from somewhere on your website. Also, a unique and fresh content is a must for optimizing the website. Using duplicate content for the website may result in Google penalty. Quality and fresh content not only attracts visitors but also make the website rank higher in search engine results. The Meta tags need to be correctly arranged with page title tags and description tags describing the content of various web pages. The page tags must be less than 70 characters and description tags must be less than 150 characters. You must use H tags to label varied headers on website pages. The website page URLs must be SEO friendly. Not only the people but also search engine spiders will know from the URL what the page is mainly about. You must use mod re-write for Linux hosting as well as use IIS redirect for windows. The URL made must describe the content. The links within your website must be complete. Descriptive URLs must be used for images when compared to bunch of numbers and letters. The images must be labeled with alt and title attributes. There must be good use of anchor text links within the web page content. Suppose you have content about wedding planner, then you must use the phrase wedding planner in the text that links to it. One must keep in mind that there is only one version of your website and homepage of your website. If there are few pages that need not be searched in search engines, then you must not waste your time in promoting those pages. One must place a nofollow tag in the links to the websites that you do not trust. The code that is placed must be valid as bad code can lead search engines for not reading the page correctly. One must use header tags wherever it is possible and this requires some CSS usage. Choosing the right keyword is a vital component of On-page SEO strategy to get target results. The chosen keywords must be used rightly in the WebPages. Moreover, the keyword density must not exceed 3-5%. The website can be penalized by search engines if the keyword density is high. The visitors always look for low keyword density content as it is more comprehensible to read and understand. By using on page strategies, you can easily promote your website and maximize its performance in search engine results. In this way, you can make your website rank higher in search engines. To conclude, by adopting such strategies, one can readily promote the website and make it rank higher in search engine results. Grab Ranking is a leading SEO company India providing affordable, best and top SEO, PPC, ORM and Website Design Services. Get in touch with SEO Services Company in India for reliable and affordable SEO services India today. We are one of the leading, reliable and reputed SEO India Companies providing SEO services India at very competitive rates. Grab top page ranking in leading search engines through Grab Ranking, one of the best SEO Companies India providing its best services at very competitive rates.